The purpose of an 1950 Buick engine tune-up is to restore power and performance that has been lost through wear, corrosion, or deterioration of one or more parts or units. In the normal operation of an engine these changes take place gradually at quite a number of points so that it is seldom advisable to attempt an improvement in performance by correction of one or two items only. Time will be saved and more lasting results will be assured by following a definite and thorough procedure of analysis and correction of all items affecting power and performance. The parts or units which affect power and performance may be divided, for analysis, into three groups in accordance with their function in producing (1) Compression (2) Ignition (3) Carburetion. The 1950 Buick engine tune-up procedure should cover these groups in the order given. While the items affecting compression and ignition may be handled according to individual preference, correction of items in the carburetion group should not be attempted until all items in compression and ignition has been satisfactorily corrected. Series 50 Synchromesh – 118 lbs.jsq. in. Series 40, 50, 70 Dynaflow – 120 lbs.jsq. in. Excessive or Uneven Lash Clearances. Adjust valve lash (par. 2-14). Insufficient Oil to Valve Mechanism. Check piping, oil filter, and restricted fittings to remove any obstruction to proper flow of oil to rocker arm shaft. NOTE: When an engine equipped with hydraulic valve lifters has been standing for considerable time (such as overnight) some valve noise will occur when engine is first started. This is because oil escapes from the lifters that are holding valves open against valve spring pressure. These lifters will fill with oil and noise will disappear after a few seconds of running. This condition must not be classed as excessive valve noise. To locate a noisy valve lifter remove the rocker arm cover. With engine idling place a finger on each valve spring cap in succession. A distinct shock will be felt when the valve returns to its seat if a valve lifter is not functioning properly. The valve will return to its seat with no shock whatsoever if valve lifter is functioning properly. Intermittent Clicking. This is the most difficult condition to locate. It can be located only by listening carefully or feeling with a finger on each valve spring cap or rocker arm in succession until the click appears and is located either by hearing or feeling. This type of click is almost always caused by a microscopic piece of dirt which keeps circulating through the lifter and momentarily is caught between the check valve ball and seat. In rare cases the ball itself may be out of round or have a flat spot which upon contacting the seat permits leakage of oil. Clean or replace the valve lifter (par. 2-15). Place clean paper on the floor under engine arid run the engine at medium speed until the oil is thoroughly warmed up, then stop the engine and check for oil leaks and dripping on the paper. Inspect both sides and front and rear ends of engine for wet spots. Pay particular attention to rocker arm cover, push rod cover, and lower crankcase gaskets. All external leaks should be corrected and the results noted before attempting any internal correction. Oil too light. The use of oil of lower viscosity than specified for. prevailing temperatures will contribute to excessive oil consumption. If the coolant system requires frequent addition of water in order to maintain the proper level in the radiator, check all units and connections in the cooling system for evidence of leakage. Inspection should be made with cooling system cold because small leaks which may show dampness or dripping when cold can easily escape detection when the engine is hot, due to the rapid evaporation of the leakage. Tell-tale stains of grayish white or rusty color, or dye stains from anti-freeze, at joints in cooling system are almost always sure signs of small leaks even though there appears to be no dampness. Radiator thermostat stuck (par. 12-28), radiator air passages clogged, restriction in radiator core, hoses, or water jacket passages. Vibration is usually most pronounced when driving at a certain speed. If the engine is run at the equivalent or critical speed with car standing and transmission in neutral, the vibration will still exist if the engine, clutch, or transmission is at fault. If the vibration does not exist with engine running and car standing still refer to Rear Axle Trouble Diagnosis (par. 5-3, 5-4, 5-5) and to Car Roughness or Vibration (par. 6-12). An engine which is not properly tuned up will run rough and vibrate, particularly at idling and low speeds. 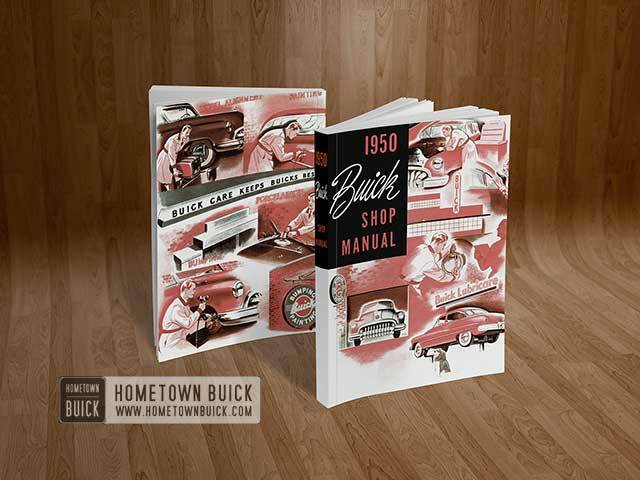 A thorough 1950 Buick engine tune-up operation is the proper correction (par. 2-9). Vibration existing with Dynaflow Drive may be due to unbalanced flywheel or the converter primary pump. Procedure for balancing these parts is given in the 1948-49-50 Dynaflow Transmission Shop Manual, paragraph 30.